Stinging Nettle Spanakopita . . . or should that be Nettlekopita? This recipe adaptation is a no-brainer. Simply replace the fresh spinach in your favourite Spanakopita recipe with fresh nettle leaves. You will instantly increase the nutrient value of your dish without changing its appearance or taste. Not only that, but you’ll have the satisfaction of knowing that you’ve used a wild food in your diet. Here’s my favourite Spanakopita recipe using fresh nettles from my back yard. This makes one 9 x 13″ pan or a whole mess of individual triangle pies . . . which are really good for appies, but they sure take a long time. Preheat oven to 350 degrees F. Lightly oil a 9 x 13″ baking pan. Saute onion and shallot in hot oil till tender and lightly browned, then add green onions and garlic and saute for another few minutes. In a mixing bowl, stir together the eggs, cheeses, parsley, dill and nutmeg. In a separate large fry pan, wilt the freshly washed leaves by heating gently over low heat. There is no need to add water, as the water on the leaves will be plenty. USING GLOVES squeeze out the nettle leaves and put them in a mixing bowl. Gently toss in the onions, shallots, and green onions. Add the egg and cheese mixture. Lay one sheet of phyllo in your 9 x 13″ baking pan, making sure the remaining sheets are covered with a damp towel to prevent them from drying out as you work. Brush the sheet lightly with melted butter. Repeat with the remaining 3 sheets. Spread the filling evenly in the dish. If the sheets extend beyond the dish, just fold them over the top of the filling. Then add the remaining 4 sheets, one at a time, brushing each with melted butter. Brush the top with melted butter and tuck in any bits of phyllo to seal. Score the top layer with a sharp knife into serving size pieces. Bake at 350 degrees F. for 30 – 40 minutes. Cut into squares and serve hot. Feel smug knowing that you’ve reduced your carbon footprint by eating locally grown food. 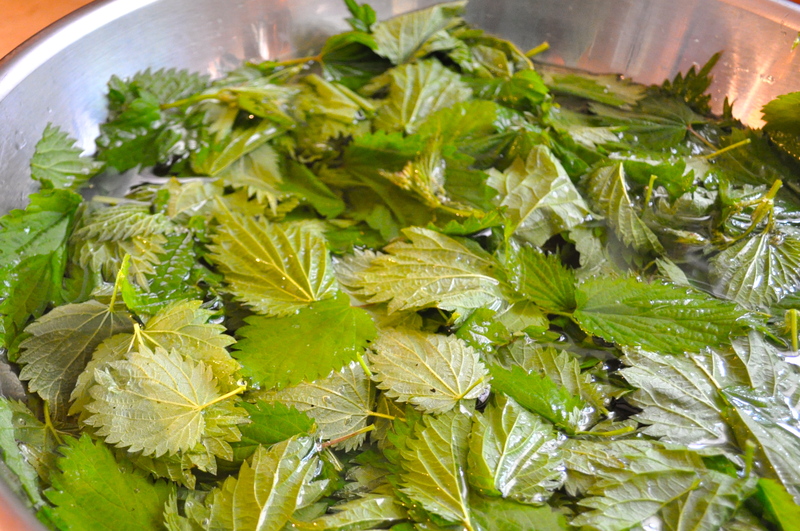 Do you cook with stinging nettles? What have you made, or what ideas do you have for adapting recipes to substitute nettles? This entry was posted in appetizers, vegetarian meals and tagged cooking with stinging nettles, feta cheese, filo, nettle spanakopita, nettlekopita, nettles, phyllo, preparing stinging nettles, spanakopita, stinging nettles, vegetarian meal, wild foods in pacific northwest. Bookmark the permalink. 2 Responses to Stinging Nettle Spanakopita . . . or should that be Nettlekopita?